A harp seal found dehydrated on a New Hampshire beach last month has been rehabilitated and released back into the ocean. The gray seal named "Mack" was found Feb. 15 at Hampton Beach State Park in Hampton eating sand, according to officials with the Seacoast Science Center Marine Mammal Rescue Team. The animal welfare organization said Mack had been alert and responsive to noise and movement but had discharge coming from both eyes. After determining he needed rehabilitation, Mack was transported to National Marine Life Center (NMLC) in Bourne, Massachusetts for care. Further tests showed critical dehydration and radiographs showed that he had rocks in his stomach. 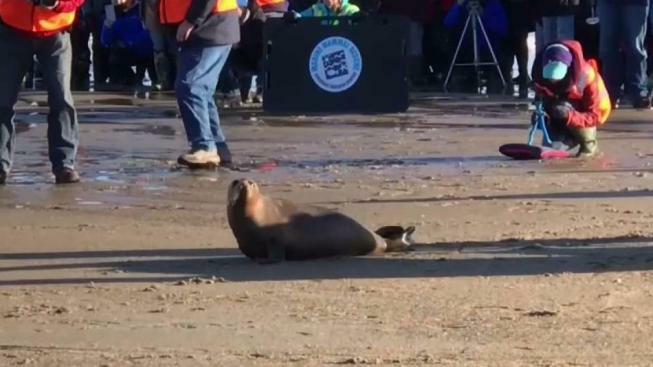 According to the Seacoast Science Center Marine Mammal Rescue Team, Mack quickly bounced back and began regaining his strength. He was ready to be released back into the wild on Sunday afternoon on Hampton Beach where dozens of people sent him off with cheers. Marine officials said Mack will likely migrate back to the Canadian Provinces and the Arctic.